Part of the idea here is to teach YOU how to tell stories. I work alone with a small digital camera – “pro-sumer” as they say. I’m holding a Canon XL1 the first of the high end HI8 cameras – it had interchangeable lenses, less than $3000.00 and easily fit in a Domke bag. 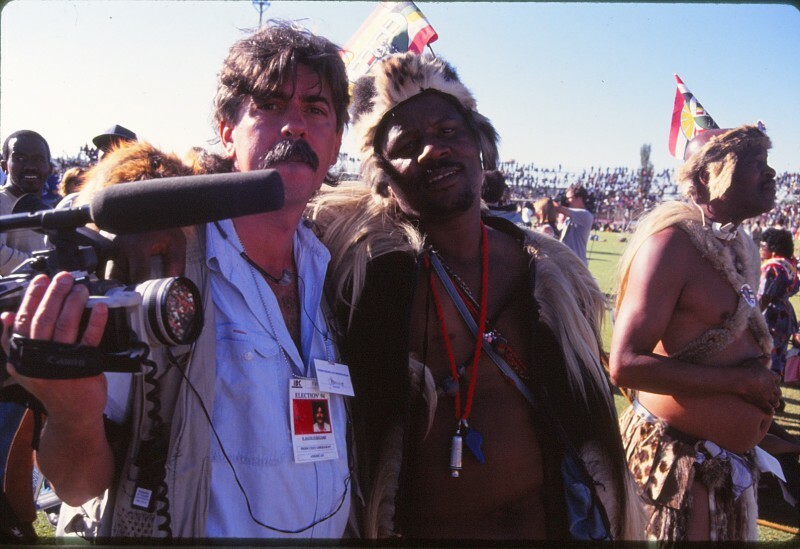 Yet there I am at a Zulu rally in South Africa in 1994 just like a real, regular journalist. Go back up to the drop-down menu and click on the area you’re interested in: lighting, editing, shooting etc. I wish I could figure out how to make links to THOSE pages in THIS page but, you know, there’s only so much technical stuff I can cram into my head so anybody out there with a knowledge of code and CSS could do me a big favor and show ME how to do THAT!